With more than 3.8 billion users worldwide, the Internet has allowed workers and youth to be more connected and internationally-integrated than ever. In response to open censorship by the government and media corporations, the IYSSE opposes any efforts to limit Internet accessibility, free exchange of information, and rights to privacy. The massive surveillance apparatus must be dismantled. The witch-hunts against Edward Snowden, Julian Assange and other whistleblowers and journalists must end. The Internet must become a free, accessible, and democratic resource! End government censorship of the Internet! 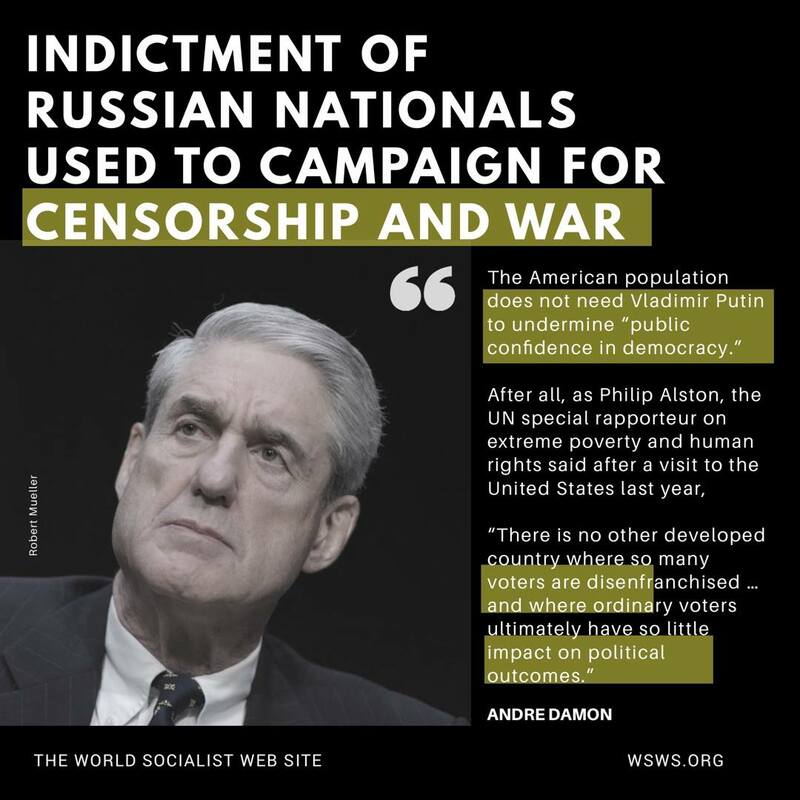 The campaign within the American media and political establishment over allegations of Russian “hacking” and manipulation of the US elections is being transformed into an increasingly frenzied demand for the criminalization of political dissent not just within the United States but in countries around the world. One major features of this campaign has been an attempt to censor the Internet of “left-wing” websites. This has been spearheaded by elements within the American ruling class, in close collaboration with some of the largest and most powerful corporations such as Google and Facebook. 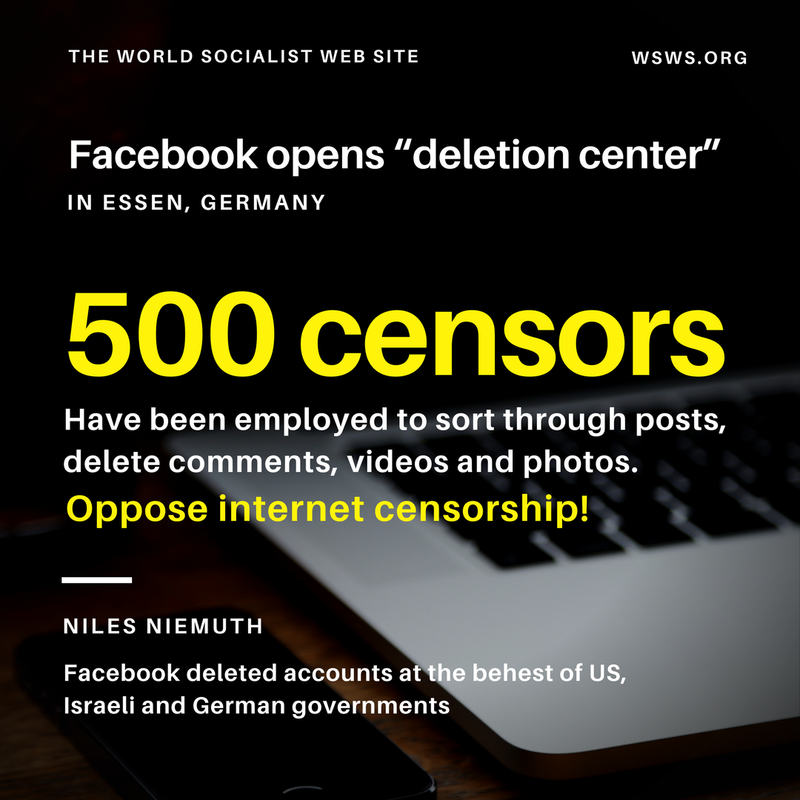 As the World Socialist Web Site has documented, Google’s search algorithm in April, introduced under the pretext of combating “fake news” and promoting “authoritative content,” have resulted in a fall in referrals from Google to the WSWS by nearly 70 percent, and to 13 other left-wing sites by between 19 and 63 percent. Facebook, Twitter, YouTube and other platforms are preparing or have already begun to implement similar measures. Under conditions of growing popular opposition to social inequality and war, and deepening political crisis, establishing state control over the Internet is seen as a matter of the greatest urgency. Internet censorship represents an immense threat. Core democratic rights are under attack. The campaign must be resisted. Similar efforts are underway internationally, with European governments seeking to place severe restrictions on the functioning of social media. Facebook’s latest announcements come straight from the murky language of Mark Zuckerberg himself: “I’m changing the goal I give our product teams from focusing on helping you find relevant content to helping you have more meaningful social interactions.” By “relevant content”, Facebook means content that seeks to inhibit awareness of social issues. Critical news and political content will be deprioritized, while people’s feeds will consist of empty, localized media that tell nothing of the widespread attacks carried out behind the backs of the international working class. To assist with this reorganization of the platform, the company will use human “fact-checkers” and AI systems to collect, monitor and interpret all the information posted on its social media platform. Join the Coalition to Fight Censorship!